While women were denied participation in masculine activities, there was no shortage of male tailors or chefs. So the first step of the feminist movement, was to have society accept women in traditionally masculine areas of interest. I grew up in a family that believed in gender equality. So I was given every opportunity my brother was given. I never felt discriminated against. And I wondered what the hoopla of feminism was about. To me it seemed like a battle of the past, and that we should stop complaining about it and move on. The reservations for women, weather it was in the form of seats on the bus, or seats in colleges bothered me. These reservations, to me, implied that women were weaklings, that needed the charity of society. I for one, did not want that charity. The sheltered world I grew up in, resulted in this perspective. I considered reservations in colleges an insult to my intelligence. I had worked hard and was as good as any of my male counterparts. Yet, reservations in colleges for women would diminish the value of my efforts. People would assume I got in, because of the reservations. Teens often tend to be self centred. It was all about me. I did not care to notice, how many women these reservations benefited. How many women were disadvantaged, because their families would not shower the luxury of education upon them. How many girls were denied the achievement of their full potential, because families skimped upon resources, when it came to educating girls. How many girls had their confidence undermined everyday, because they were told their success was unimportant and not particularly desirable. Worse, some were probably told they were not wanted and their parents would have preferred a boy. Over the years, I learned the value of affirmative action in helping disadvantaged groups catch up with the rest of society. Affirmative action does not insult the capable, but it gives a statistical push to a disadvantaged section of society, to make up for the discrimination they suffer as a group. Is there corruption involved? Just as much as in anything else. But then the problem does not lie with affirmative action. Corruption must be weeded out, wherever it exists. However, there is a more subtle aspect of discrimination against women that took me a while to notice. And this one is much harder to eliminate. There is a certain glamour and importance attached to male dominated activities and attributes more prevalent among men. For example, in an enlightened household, a girl will often be encouraged to become an engineer, but what about a boy who wants to take up embroidery or sewing? Even this situation is slowly improving. But this form of gender bias, is so insidious that it often goes unnoticed. When I was growing up, watching TV was considered a waste of time, unless it was to watch sports. Why is that? What is so special about watching sports and what makes it superior to soaps? It is just a passive form of entertainment. Ah wait. But it is the passive form of entertainment that is commonly enjoyed by men. Is that why it has a special status in our society? What about attributes? Society considers being aggressive, tough and competitive to be desirable attributes. While being emotional, expressive and open to receiving help are considered signs of weakness. If you give it some thought, you will see, that society tends to value attributes that are more common among males and frown upon attributes that are more common among females. And if you really think about it, there is no objective reason, why one set of attributes is better than the other. 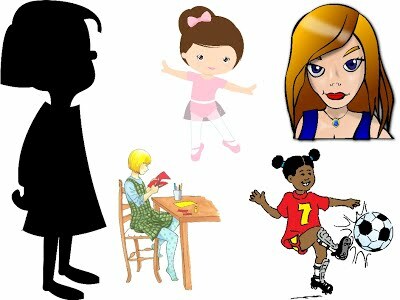 Over the years I have realised that there are many faces of the girl child. The innocent one, that barely registers any difference between the genders. My daughters are at this stage. My older one could not even tell girls and boys apart till she was 3. In raising kids, it may be a good idea to prolong this stage by raising them in a gender neutral way. The accepting: If a girl is brought up to believe she has to fulfil the expectations of her parents, society and the family she marries in to then she may accept it and believe that is her purpose. She may even be happy with it. But is she cheating herself of finding out who she really is and what she is capable of? The determined to prove herself: Sometimes a girl is brought up to believe she can do anything. But there is a subtext that says the things guys typically like to do are cool while things girls typically like to do are lame. So sometimes a girl goes out of her way to be boy like in appearance and manners. While that is great if that is her choice, it is self defeating if it is a result of insecurities. There are also girls who feel angered by affirmative action, as I did, or who feel the need to prove themselves to be as strong as or stronger than their male counterparts. Notice though, that boys rarely feel the need to prove themselves to be as good as or better than girls. Femme fatale: These are the girls that believe that their beauty is their weapon. While it may feel empowering at the core of it their power depends on the approval of others. Subconsciously they may be aware of it and carry that insecurity with them. As parents raising these complicated and sensitive teenage girls, we need to steer them towards real confidence and contentment, which comes from within and can only be achieved by being true to oneself. We should encourage our daughters to find out what they are passionate about, and what they excel at, without giving their interests a gender label. That way they can explore their abilities, to find something, that brings them joy and fulfilment, without having to worry about proving themselves, or being accepted. The confident and happy woman, that emerges will then be kind, compassionate, competent and beautiful without the insecurities that diminish these qualities.